M&M’s World London is the world’s largest chocolate store or as the Americans call it – candy store. Located in the world-famous Leicester Square, M&M’s World London is a huge draw with children and adult chocolate lovers alike. M&M’s are one of the most popular confectionery brands on the planet. M&M’s World London is, the first M&M’s World store to open outside the USA. 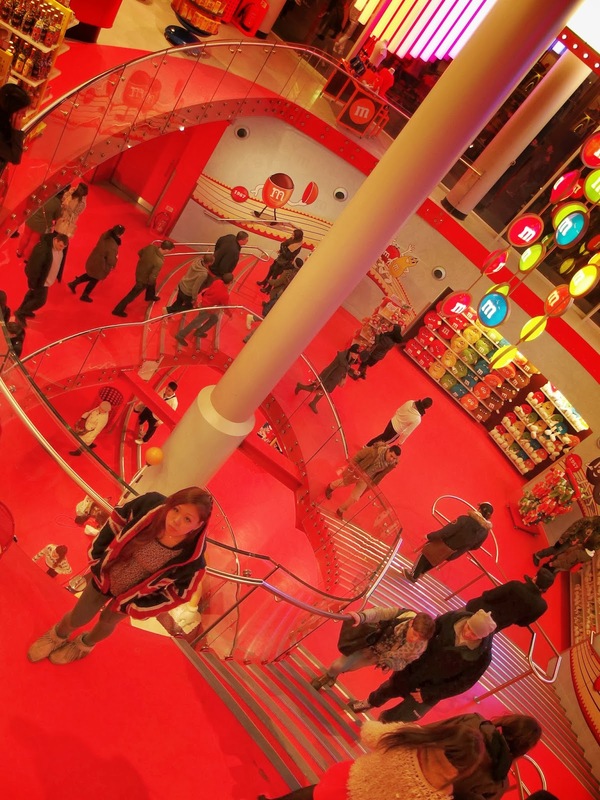 Comprising four floors and 35,000 square feet of multi-colored M&M-branded chocolate and other goodies, the attraction opened in 2011 and swiftly rose to prominence, becoming a firm-favorite London attraction for families. After seeing many posters around London advertising M&M’s World in Leicester Square, we finally got there one Friday night. As we entered, we were welcomed by M&M’s double-decker bus and a fragrant chocolate smell filled the air. Even though it was past 9pm when we reached Leicester Square, people were still crowding inside looking for sweets and gadgets with M&M’s images. So what did we do…? Haha! We then joined them joyfully looking for some fun and reminiscence of childhood! The store is home to an enormous range of M&M’s merchandise, from kitchenware to jewelry. The highlight of M&M’s World London has to be the giant wall of chocolate, from which visitors can create their own personal M&M’s selection. M&N’s World, which is a four level shop dedicated to colorful sweets, offers them in abundance and it also offers some interactive attractions too. Such a role seems to be played by M&M’s laboratory located on the lowest level, which allows getting a glimpse of the sweets production process and things related to that. Each of the four levels were different. We enjoyed all of them, though they they offer more or less similar things, but in different styles/color schemes etc. But the lowest one, with the mentioned laboratory, dispensers with M&M’s in dozens of colors and real size candies imitating The Beatles on the zebra crossing, is mostly worth seeing. Other than paying homage to The Beatles’ zebra crossing on Abbey Road’s album cover, the M&Ns pay homages to the guards from Buckingham Palace, the famous red London bus and other iconic London images too; needless to say, these tributes provide great photo opportunities for tourists in London. All of the levels are full of sweets, gadgets and M&M’s history. I got to know that M&M’s were born during WWII and over the last seventy years have been changing shapes and appearance. You’ll also find out that there are female and male candies and each color symbolizes a different mood. This same “mood machine” is also supposed to be able to scan you on a platform, showing your current state-of-mind/mood on a screen in front. There are many unusual products in this huge, colorful space! Definitely mood-lifting, do drop by if you happen to be in the area – I’m sure you’ll leave with chocolates in your bag (or belly).